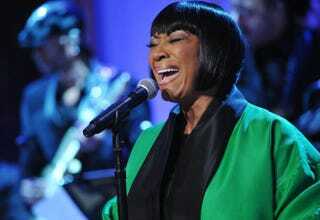 Patti LaBelle performs at the White House March 6, 2014. Say her name: Ms. Patti, Patti! The incomparable Patti LaBelle has been added to the fourth season of FX’s American Horror Story: Freak Show. According to TV Line, LaBelle will join the cast for four episodes and will portray the mother of Gabourey Sidibe’s character. American Horror Story: Freak Show’s plot will focus on the last American freak show and be set in Jupiter, Fla., during the 1950s. Labelle, along with playing Sidibe’s mother, will play a local who attempts to help unravel the secrets behind the freak show’s deadly killer clown. LaBelle will be joined by Jessica Lange, in the lead role; Kathy Bates; Angela Bassett; Frances Conroy; Sarah Paulson; Michael Chiklis; The Hunger Games’ Wes Bentley; Fargo’s John Carroll Lynch; and The Normal Heart’s Finn Wittrock. Chiklis will play Bassett’s husband and Bates’ ex-husband. The new season of American Horror Story will premiere in October.